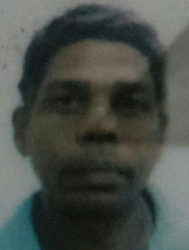 The partially decomposed body of a man who was missing for two days, was yesterday afternoon found in a canal at Onderneeming, Parfait Harmonie, West Bank Demerara, a short distance from his home. Robin Raymond Elkanah Gordon, 40, of Lot 2273 Onderneeming, Parfait Harmonie, was last seen by his relatives on Wednesday afternoon. He was an alcoholic and would usually go missing for days before returning home. Yesterday, his family’s worst fears were confirmed after two girls spotted the man’s partially decomposed body lying near the trench during their afternoon walk. An alarm was raised and the police summoned. As the news spread, villagers flocked the site to get a glimpse of the body. When Stabroek News arrived at the scene, several police officers were present, directing traffic while detectives cordoned off the area to conduct the necessary investigations. Due to the state of decomposition, the police were unable to state whether the body bore any marks of violence. They are awaiting the results of a post-mortem examination which is scheduled for Monday, to determine how Gordon met his demise. Gordon’s only child broke down in tears and had to be consoled by other relatives at the scene. The young man, who does not reside with his father, related that he last saw Gordon sometime last week. “He keep calling me to come see him and I was just busy with work that I ain’t get time to come,” the weeping son related. He said he was at work when he received the news of his father’s death via a telephone call. While Gordon’s relatives could not say what led to his death, many speculated that he may have been returning home after consuming alcohol when he suffered a seizure and fell. “He does usually get fits and fall down a lot because he does drink too much,” one relative said. He related that he last saw Gordon alive on Wednesday when he visited the house. “His father (Gordon’s father) is elderly and he don’t feel well everyday so I does visit him once in a while, and is up to Wednesday me and my wife came and we saw him before he left and he said he going to the shop,” the man recalled. The body was taken to the Ezekiel funeral parlour to await an autopsy.